LOCATION This attractive, four bedroom family home is set within an enviable cul de sac location, just off Comptons Lane. For those needing to commute, Horsham Station has a direct line to Gatwick (17 minutes) and London Victoria (56 minutes) and is within walking distance from the property. There is also easy access to the M23 leading to the M25. The property also sits within close proximity of some of the area’s most popular schools, which includes Forest Boys and Millais Girls Secondary Schools. PROPERTY The front door opens in to a Hall, which has stairs leading to the first floor and doors opening to the Living Room and WC. The generous Living Room overlooks the front garden, and provides the ideal space to relax at the end of a long day. From here a door opens to the 14’7 x 10’3 Kitchen Breakfast Room, which has space for a range of appliances and breakfast bar, doors spilling out to the Rear Garden, and an opening that leads through to the Dining Room. 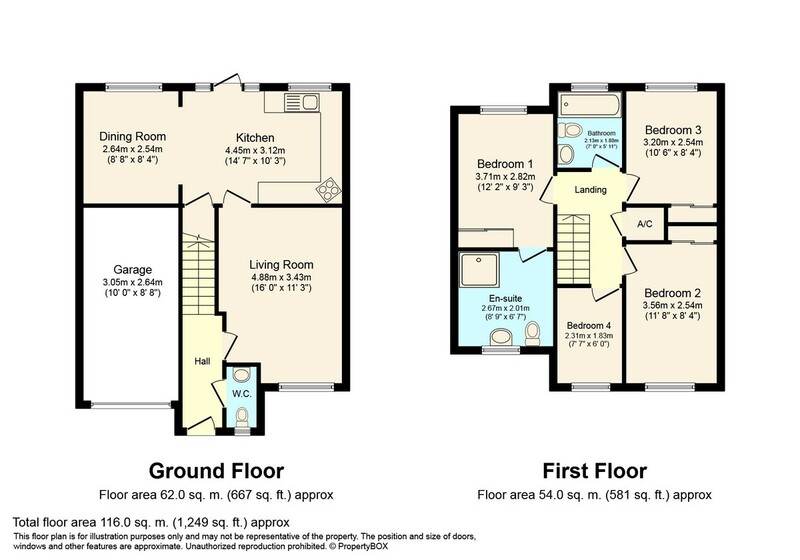 To the First Floor, you will find the Family Bathroom and four Bedrooms, three of which are fantastic doubles with built in Wardrobes. The Master Suite measures 12’2 x 9’3 and offers an En Suite Shower Room. The property benefits from uPVC double glazing and radiator central heating throughout. OUTSIDE This attractive four bedroom family home is set back from the road with driveway providing off street parking. The driveway is next to an area of well kept lawn, and leads to the integral Garage, which has an up and over door. Gated side access takes you through to the well stocked Rear Garden, which backs on to Millais playing fields. A paved patio, provides the ideal space for barbecues in the summer months, and leads on to an area of lawn, which is surrounded by mature borders. At the bottom of the garden is an area of shingle and a shed offering extra storage.